We’ve rather enjoyed Kingdom Come: Deliverance for its historical setting and open role-playing choices. Yet there’s no denying that the vast array of game-breaking bugs and glitches have brought the experience down for a lot of players. A new patch deployed today promising plenty of improvements, including better performance, tweaks to saves, and “over 300” fixes for various quests. 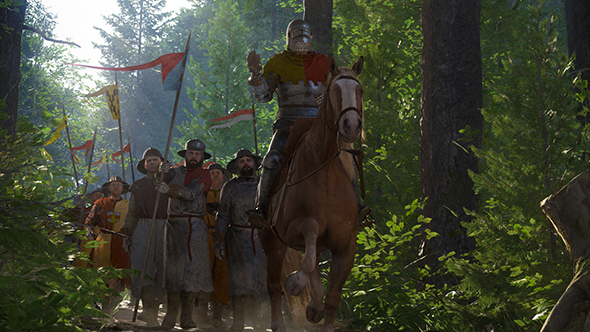 Check out our full Kingdom Come: Deliverance PC review for more. The performance improvements include takes for level of detail switches to help reduce pop-in and improve texture streaming, and stuttering in some areas has been reduced. You can now toggle VSync for 30 or 60fps caps, letting you stabilize performance on lower framerates without the need for a third-party tool. There’s also “improved CPU load balancing,” which should also contribute performance gains. Saving is apparently now “much more robust,” and you no longer have to worry about corrupted saves if the game crashes while saving. There’s now a save and exit feature, and support for Steam Cloud saves. Guards will also frisk you less often, which I imagine is a good thing. You can see the full patch notes on Steam.